Lil Uzi Vert reflects on simpler times. The man who made shoulder-shimmying an artform has been in his feelings of late. Of course, Lil Uzi Vert's long documented struggle with Atlantic Records has brought the rapper's frustrations to a boiling point. Now, the anger has dissipated, leaving in its place a palpable sense of wistful melancholy. One best equated to the feeling of all your friends being dead, perhaps. 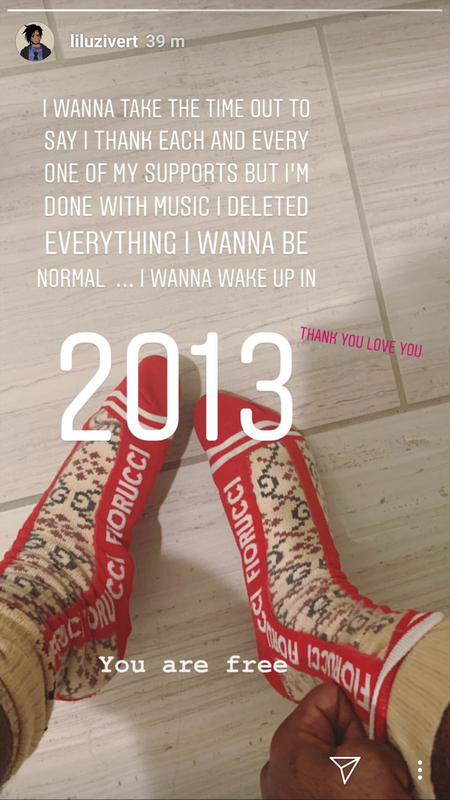 In any case, Uzi has been opening up about his increasingly distanced perspective on the music business, going so far as to "delete" his entire unreleased catalog. Now, the rapper has doubled down on the narrative, wishing he could once more feel the sweet excitement of a studio session. Interestingly enough, Uzi has seemingly embraced satanic imagery across his music and visual aesthetic. In that sense, his metaphorical deal with "the devil" is tinged with a sense of bitter irony. Of course, his predicament is frustrating for all parties, especially those with his well-being in mind. It can be devastating to fall out of love with a passion, and it would appear we're witnessing the process unfold in real time. Hopefully Lil Uzi Vert can find a sense of peace, or change his name to a symbol, or both. Best wishes to Uzi. It's never fun to see an artist systematically drained of passion, and we can only hope that Eternal Atake is not lost as a piece of collateral damage. Of course, it's entirely possible that this is all a calculated publicity stunt for his upcoming album, and he'll be quick to hit us with the "PSYCHE!" without remorse.